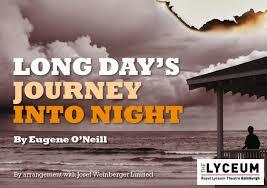 The British premiere of Eugene O’Neill’s Pulitzer Prize play, “Long Day’s Journey into Night” was staged at the Royal Lyceum Theatre in the Edinburgh Festival 1958. As a cathartic release of private emotions, this is O’Neill’s brutally honest, autobiographical portrait of his own family: James and Mary Tyrone (based on his parents, John and Mary), their elder son, Jamie and his brother Edmund representing Eugene as a young man. The setting is their beachfront Summer home in Connecticut, across one single day in August 1912. The living room is simply furnished – blonde oak, pale blue Shaker wood, wicker chairs, lace-clothed dining table, book case, piano and central staircase. The action begins with an everyday scene at breakfast time. 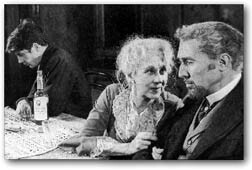 But from morning sunshine to late evening lamplight, we gradually witness the truth and tragedy within the family relationships as they delve into their individual haunted pasts. Physically frail, the consumptive Edmund is a quiet intellectual with a passion for theatre and Shakespeare; he‘s a dreamer, wistfully remembering a sailing trip to South America, the freedom of the sea. 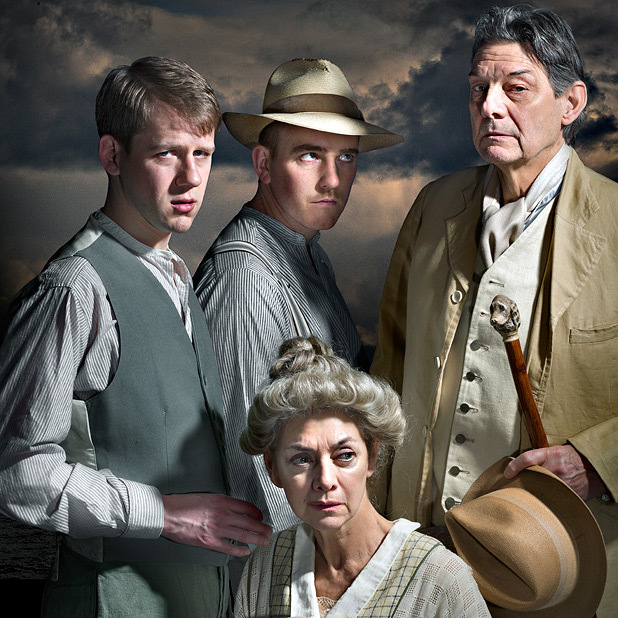 The rollercoaster journey into the past for the Tyrone family is dramatised like an ocean-going voyage: waves of deep, dark emotion, moments of calm sea, stormy debate and hard hitting argument like thunderbolts. 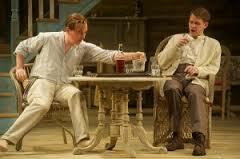 Intimate conversational duets – James and Jamie, Mary and Edmund, James and Mary, Jamie and Edmund – are artistically staged like a series of softly lit “Hopper-esque” vignettes. Scene changing music of soft cello strings and the gradual darkening shadows of night create a tangible melancholic mood, the ebb and flow of simmering tension. The entire cast is impeccable in capturing the multi-layered personalities, each trapped in their own fraught and fragile emotional state. Paul Shelley (a tall gentle bear of a man reminiscent of Harrison Ford), shifts with ease between dominant patriarchal figure, loving husband and desperate alcoholic drinker. With graceful elegance, Diana Kent as Mary glides across the stage perpetually distracted in a world of her own – we feel her inner torment; kissing her crucifix pendant, she realises the loss of her comforting Catholic Faith. A recent Royal Conservatoire graduate, Timothy N. Evers is pitch perfect as the troubled, tortured soul, Edmund, relating his travel tales with poetic precision and pace. Adam Best portrays the boorish, hard drinking Jamie with a subtle mask of self-pity to try and regain his family’s respect. 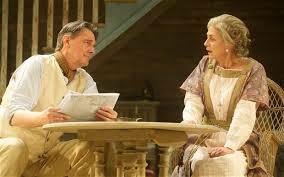 If there any quibbles, sight lines are poor if sitting in the far right hand stalls, (e.g. F 4 nd 5), obstructing views of the staircase and a window, at which Mary often stands staring out to sea. Fog is a recurring theme, both the actual weather slowly permeating the porch outside, but also symbolising the isolation and loneliness they all feel. The fog could perhaps have been used for more dramatic effect with a drowning cloud of dry-ice to envelop this Summer house of despair – this family home of enduring love. Poignant, profound, engrossing, this is an exquisitely choreographed production by Tony Cownie. The audience watched and observed the Tyrone family in utter silence, drawn into their complex lives and heartfelt memories. Fifty six years after its first performance on the same stage, this is a gracefully cool and classy revival of a classic American masterpiece. 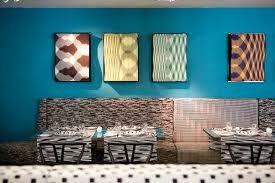 Bistro Moderne by Mark Greenaway: fashionable, smart, classy cuisine. 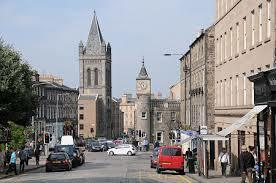 Edinburgh district of Stockbridge – art galleries, boutiques, delis, cafes, bars, bistros. Deanhaugh Street, Edinburgh, has long been known locally as “Restaurant Row” from Rafael (Spanish) to Sabor Criollo (South American), the Italian Kitchen and Pizza Express. 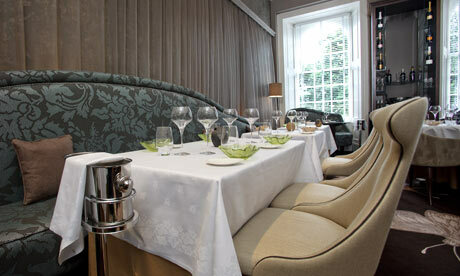 On St Stephen’s Street, the Stockbridge Restaurant and Purslane are renowned for fine dining. Nearby, Tom Kitchin’s new Scran and Scallie gastropub was described by AA Gill in the Sunday Times as one of the best places to eat in the UK. A warm welcome and congratulations to Mark Greenaway for opening his second restaurant in the fashionable, foodie district of Stockbridge. Like Mr Kitchin, culinary empire building makes good business sense as well as a fresh challenge and creativity for a Chef’s talented kitchen brigade. 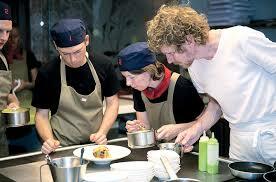 Mark Greenaway is an ambitious young Head Chef who has achieved well deserved success in the past few years. 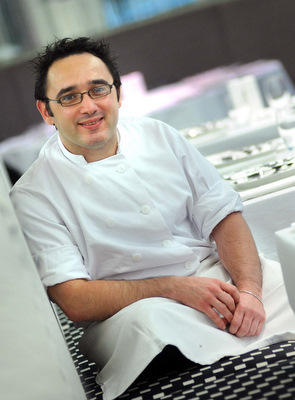 After being named Rising Star Chef of the Year, 2011, when working at Dryburgh Abbey hotel, he moved to Edinburgh to open his eponymous Restaurant on Picardy Place. Last year, he moved his restaurant to a prime address on North Castle Street. Numerous awards, accolades and 3 AA rosettes have followed for this new celebrity chef, with appearances on the BBC Great British Menu series and recently Teen Canteen. No wonder. His imaginative, artistically colourful dishes have a touch of Blumenthal in their magical, scientifically inspired, smoke-filled glass jar, deconstructed, unique cuisine. 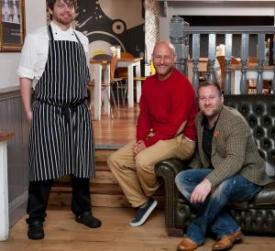 November 2013: When Mark heard of the recently vacated Café Fish venue on N.W Circus Place, Stockbridge, he immediately signed a lease to launch his classy yet casual, Bistro Moderne. A Bistro is defined as, “in its original Parisian incarnation, a small restaurant serving moderately priced simple meals in a modest setting”. Here, the original classic Art Deco old Bank interior, with marble floor and wood panelling has been stylishly refurbished with plush leather and soft tweed. A smart Cocktail bar with high stools is an attractive central feature opposite the theatre kitchen. From the descriptions of the dishes, I am not sure if “simple” is accurate. The list of ingredients reads like his typical trademark, inventive creations served in his fine dining city Restaurant but this is his modern Bistro food, “ Honey-glazed ham hock ballontine, quail’s egg, smoked pineapple, pea shoots”. “Pot Roasted free-range chicken, bacon waffle, braised lentils, cabbage pancetta”. 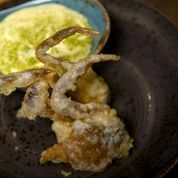 From a list of eight starters on the A la carte dinner menu, my partner Ken selected the Soft Shell Crab – an everyday, cheap spicy dish in Singapore, but unusual to find here. Deep fried, like fat crunchy chips, eat the crab bites with your fingers, and dip in tartar sauce: these are utterly divine – I “stole” two to sample – while Ken devoured the lot in minutes. Meanwhile, I loved my richly textured Smoked Salmon, attractively presented with capers, cucumber and herb leaves. For main course, again a diverse choice from Lamb, Duck and Pork as well as several fish dishes. Enticing sides too – Roasted Heritage carrots, Wilted greens with Almonds, as well as good old Pomme Puree (Mash!). Ken selected Poached Cod cooked in red wine with crispy squid, wild mushrooms and polenta. The perfectly cooked seafood, creamy polenta and earthy flavours is an exquisite, tasty and hearty dish. Meanwhile I was equally pleased with Roasted Hake and delicious salt cod croquette complemented by the distinct tastes of fennel, beetroot and spinach. What made it work well was the perfect portion size with tiny, colourful dabs of puree, pickle and green leaves. Art on a plate. Desserts are equally important in Greenaway’s kitchen. In fact he has created a new Award to find and inspire the best amateur Pastry chef, in conjunction with brewery, Innis and Gunn. Renowned on the Great British Menu for deconstructed Eton Mess, he and his team take traditional puddings to devise a modern version. 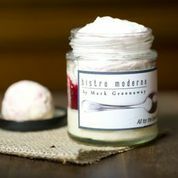 Here at Bistro Moderne you can sample a re-styled Bread and Butter Pudding, or the fun to eat Jam Jar – Rice Pudding with cranberry compote and ripple ice cream. You can expect lots of yummy chocolate treats too. Fine Cheeses are from Iain Mellis Cheesemonger just down the road and bread from the local bakery. Food and drink are treated with serious attention here: an A la carte menu, blackboard daily specials and a 5 course Grazing menu with inventive wine/beer/whisky flights as well as fabulous cool cocktails. 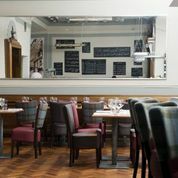 Open seven days a week, with breakfast served Friday to Sunday and great value Lunch (£15 for 3 courses), and traditional Sunday Roast Lunches, Bistro Moderne is sure to attract local residents and Foodies across Edinburgh to visit morning, noon and night. Stockbridge, with its popular Farmers’ market on Sundays, Artisan delis, cafes, bistros and restaurants, is now truly the Foodie Heaven district of Edinburgh. Taking pride of place on my kitchen bookshelf is Relish Scotland, an attractive selection of original recipes from leading chefs and restaurants around the country. Now, a second edition has been published, cleverly entitled “Relish Scotland, Second Helping”, with an introduction by one of the celebrated superstars of British cuisine, Tom Kitchin. 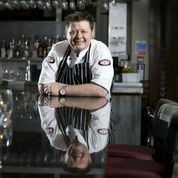 As well as a busy life in Edinburgh, in charge of three restaurants, he is often seen cooking or judging events on BBC TV – Masterchef and Saturday Kitchen. Scotland’s natural larder – Aberdeen Angus beef, venison, grouse, salmon, smoked fish, farmhouse cheeses, summer berries, wild herbs, organic vegetables, oats and barley creates a “Gastronomic heaven.” Shellfish in particular has an international reputation for quality: hand-dived west coast scallops and langoustine, Loch Fyne oysters as well as the lucrative European lobster market – Scotland is recognised as leading the way through its sustainable fishing methods. The provenance of fresh, seasonal produce is a source of inspiration for our enterprising chefs – the number of Michelin and Award winning restaurants has increased dramatically in recent years. Good Food tourism is a fast growing business where over 70% of visitors say they are keen to taste Scottish regional specialities and its exceptional world class cuisine. 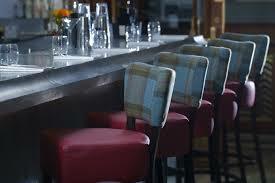 Relish Scotland takes you on a delicious journey from city restaurants and Highland hotels to Country Pubs and Inns. 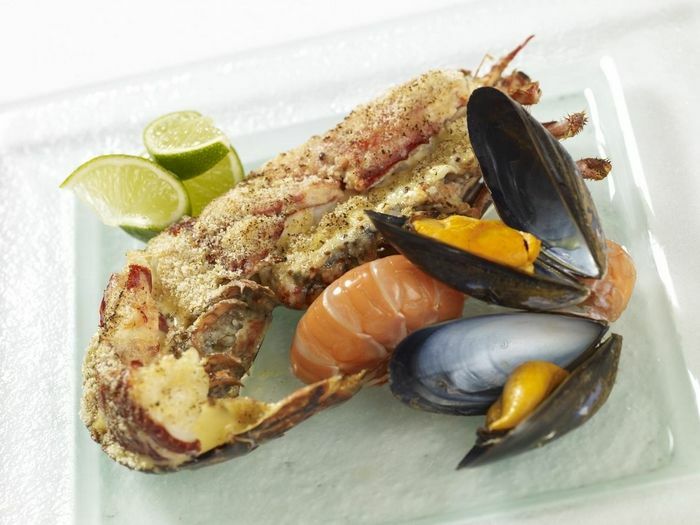 The diverse list includes Airds, Argyll, Killiecrankie, Perthshire, Craig Millar @ West End, St Monans, Seafood Restaurant, St. Andrews and Wedgewood, Edinburgh – it’s both a perfect travel guide to plan a Foodie’s itinerary, and as a speciality Cookbook to create some appetising dishes yourself at home. Stunning images accompany the recipes which are clearly laid out in easy, step by step stages. Aimed at the amateur or accomplished cook the instructions are straightforward with a glossary at the back to explain classic French cookery terms. Handy tips too as well as suggestions for ideal wines, and a list of the best suppliers, fishmongers, bakers, dairies, smoke-houses, and Cookery schools. 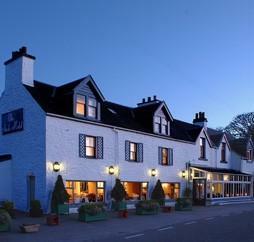 Airds is a charming white-washed old Coaching Inn in the N.W Highlands, a few miles north of Oban at Port Appin a stone’s throw from Loch Linnhe. For 27 years it has been listed in the Good Food Guide and described in Sawday’s Special Places to Stay as “Flawless service, ambrosial food”. The selected dish from their menu is Roasted Loin of Venison with tortellini beetroot and apple and bramble jus. The photograph to illustrate the recipe shows it off well – pink, tender meat well complemented by the sweet blackberry fruit. 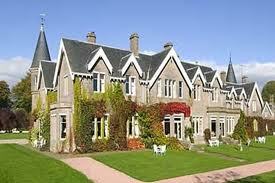 Another classic Country House is Ballathie, Perthshire on the banks of the River Tay. 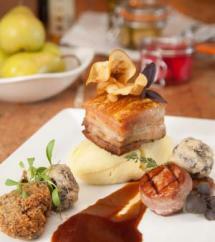 The cuisine is based on local Tay salmon, Estate beef and produce from the kitchen garden. 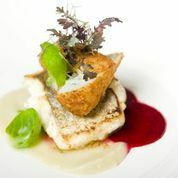 At home, you can make Scott Scorer’s speciality dish, “Roast Turbot, with Celeriac fondant and herb crusted potatoes”. 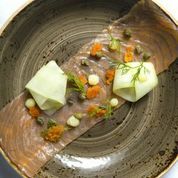 Spend a few days at Ballathie House Hotel, just a few miles north of Perth, to sample fine cuisine boasting locally sourced meat, game and fish. Go walking, cycling or motoring in the area (Castles, Gardens, Forests, Lochs), then enjoy traditional Afternoon tea in the cosy lounge, followed later by a single malt whisky or two in the bar, and of course, a superb dinner. 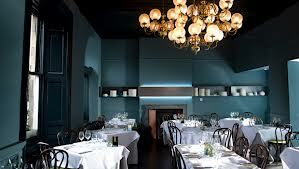 Paul Kitching opened his restaurant 21212 in Edinburgh in 2009, quickly gaining a Michelin star for his imaginative, quirky and artistic dishes. The speciality menu with selected choices for each course explains the numbered 21212 name. Relax in the plush drawing room styled dining room for a gourmet meal – and you can also stay over with luxury bedrooms upstairs. In this book, you can read how to make Kitching’s Fish Platter of Smoked fish, crab, caviar and warm sliced cucumber, created with precision and passionate flair. The fabulous, art-filled Hotel Missoni is fashionably Italian from the décor and design to Chef Camorani and his superlative food. I have eaten here many times and love his delicious Octopus and Potato Salad. One of his recipes is for the dreamy, creamy custard Dessert, “Zabaglione with white Truffle”. 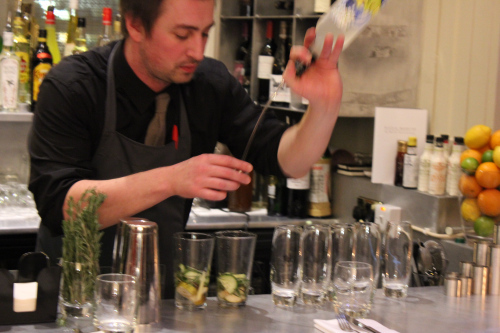 The ingredients and method look rather easy to prepare and serve in a Martini glass. Taste it slowly along with a glass of elegant, floral Soave Garganega wine. Living nearby I often visit Hamilton’s Bar & Kitchen in Stockbridge, Edinburgh (and also Treacle, its sister Bar on Broughton Street, and Blackbird, Tollcross): Popular, friendly, cosy and casual, where you can expect genuine, freshly prepared, homely, hearty dishes. Hamilton’s Big House White and Red Wine are well chosen (and very gluggable! ), or why not try a couple of cool cocktails. Assiette of Pork at Hamilton’s Bar and Kitchen. 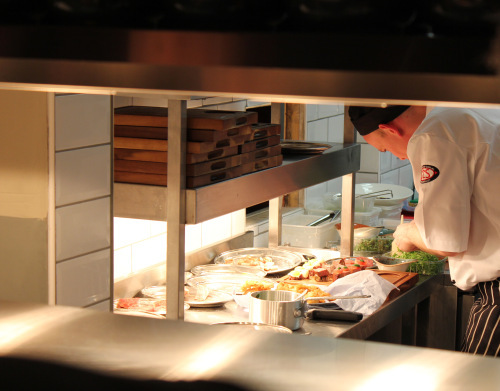 “Roast Pork Belly with Crispy pig’s cheek, Stornoway black pudding and garlic mash” is the selected main course – it may sound complex but follow the recipe with its good advice from Chef Canning on preparing perfect Crackling. Hamilton’s is warmly recommended for a superlative breakfast, lunch and supper. (Love the fat hand cut chips served in a wee bucket!). 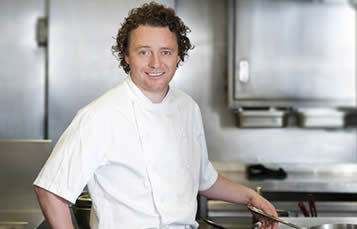 Tom Kitchin at The Kitchin was the youngest chef to be presented with a Michelin Star aged 29, in 2007. Since then he has branched out to open a second fine dining restaurant, Castle Terrace (under Michelin starred Head Chef, Dominic Jack), and recently the Scran and Scallie Pub and Dining room. Food Critic, A.A Gill of the Sunday Times is already a great fan claiming it’s one of the best places to eat in the UK. 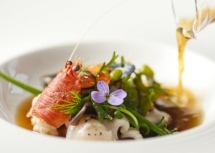 “From Nature to Plate” is Tom Kitchin’s motto, which is very well illustrated in his speciality fish dish, Rockpool – razor clams, lobster tails, oysters, squid, samphire and seaweed in a tomato consommé – which looks like an inventive Scottish Bouillabaisse with the taste of the sea. 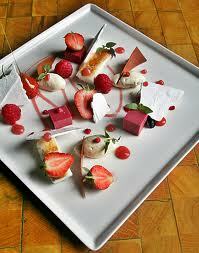 Another Chef who has proved without doubt to have an exceptional culinary talent is Mark Greenaway. 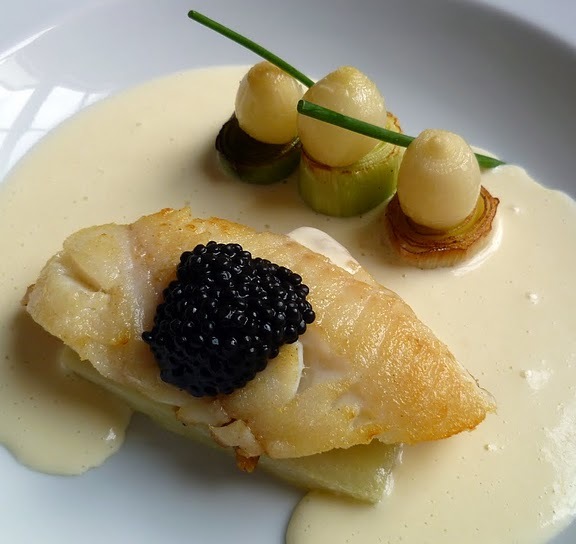 In just a few years he has moved from being Head Chef at Dryburgh Abbey hotel, (where he was noticed as Rising Star Chef of the Year at the Scottish Hotel Awards 2011) to creating his own eponymous Restaurant on Picardy Place, Edinburgh. 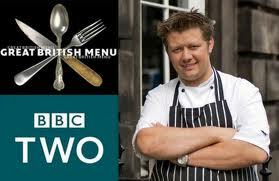 Mark represented Scotland on the BBC Great British Menu series, 2012 and 2013. 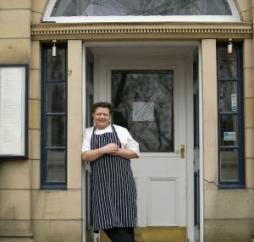 The Mark Greenaway Restaurant moved last year to a prime address on North Castle Street in the Capital’s New Town. His style of cooking is always imaginative, ironic (with a touch of Blumenthal magic), and quite simply unique where classic dishes are often deconstructed in a fresh, modern manner. His Gourmet Tasting menus are exquisitely presented. In Relish Scotland are his recipes for Cullen Skink and Eton Mess. The famous fish soup is re-created with Smoked Haddock and Maris Piper potatoes. You just have to see the image to see his inventive style of cuisine. Just outside Peebles is the Baronial, redstone, turreted Country House Hotel, Cringletie, where Patrick Bardoulet took over as head chef in 2011, accompanied by his wife Vivienne as the Manager. His starter, Trilogy of Scallops sounds and looks absolutely divine: Tartare, Souffle and Seared, attractively presented on a long, slender plate. It may be ultra-fashionable and fun to serve selected ingredients 3 or 4 different ways, but it’s a brilliant way to compare taste and texture. Having visited Cringletie a few times over recent years, it’s a fine destination for a getaway break amidst the tranquil Borders countryside. 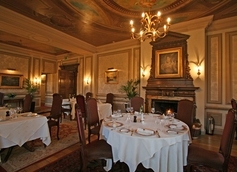 Renowned for Afternoon tea and Sunday lunch too, as well as Bardoulet’s A la carte, Tasting and Tempting Dinner menus. Enjoy an aperitif in the cosy bar first, and then wander upstairs to the grand decorative Dining Room – the perfect ambience for a romantic meal. Charming, contemporary bedrooms ensure a relaxing stay. As a reader wrote on the Amazon website, Relish Scotland – Second Helping is not just a Cookbook, it’s a Food lover’s gourmet guide to Scotland’s finest places to stay and eat. Relish Scotland, Second Helping. £20. 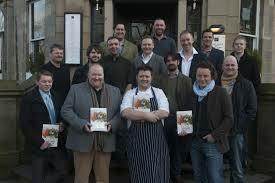 http://www.relishpublications.co.uk – Regional guides to the best UK restaurants and other celebrity Chef’s cook books. 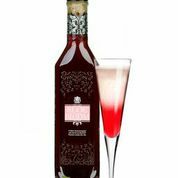 Posh Punches and Cool Cocktails for the Festive Season …. and Party-time year round. There’s more to the Festive season than Egg Nog. The tradition began in England and Europe around the 17th century as a winter warmer Egg and Grog (rum) punch, served in a noggin, a wooden mug. 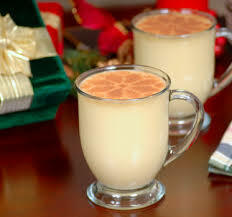 This creamy, silky boozy concoction of eggs, milk, sugar, brandy, rum, whisky, flavoured with vanilla, nutmeg and cinnamon is today more of a classic Christmas tipple in the USA. This year liven up your parties with a few fashionable new cocktails and flavoursome Punches for a fabulous Festive Spirit. 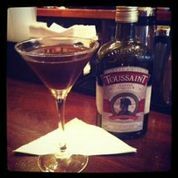 Toussaint Coffee Liqueur was named after the famous Haitian soldier and statesman, General Toussaint. The smooth Liqueur is created from natural tropical ingredients – fine Arabica coffee with a hint of Cocoa, Vanilla, Liquorice and Caribbean rum. Pour all ingredients to a cocktail shaker, add ice. Shake hard and fine strain into a cocktail glass. Garnish with three coffee beans. 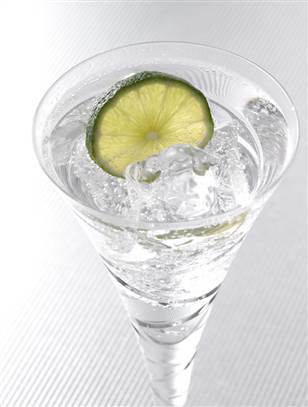 When Gin met Tonic – the match made in heaven. Until a few years ago, if you requested a “Gin and tonic please” at a bar, the bartender was not so likely to have asked if you had a preference. (You were usually given the one advertised by Gordon Ramsay). Today, gin lovers will certainly ask for their favourite brand, as well as selected style of tonic – the G&T connoisseur can enjoy as much choice as a vodka or whisky drinker. G & J Greenall has been making gin for 252 years, (the second largest distillers in the UK), so they should know a bit about blending botanical flavours. They recently re-launched their London Dry Gin, creating a bittersweet botanical mix of juniper, coriander, lemon peel, ground almonds and cassia bark. Greenall’s Gin was recently selected as one of the best 10 gins around today in a survey by The Independent. 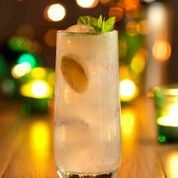 Shake the gin, ginger slice & lime juice with ice and strain into a chilled high ball glass, fill with more ice cubes and finally top up with ginger beer and garnish with mint leaf to serve. 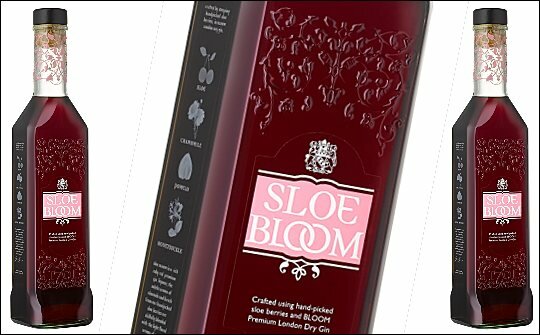 The first Sloe Bloom Gin from the producers of the premium Bloom London Dry Gin, has been launched by Quintessential Brands. Bloom Gin is distilled in a traditional Copper Still by G&J Distillers in Warrington, Cheshire, which has been distilling fine spirits since 1761. Master distiller Joanne Moore selected hand-picked sloe berries macerated in Bloom Gin. 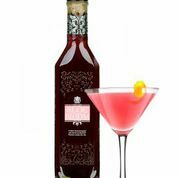 Sloe Bloom has a dark ruby red colour with the earthy aroma of kirsch and almonds, complementing the sweet honeysuckle-scented gin. This is a delicious aperitif straight up, or jazz it up in these “shaken not stirred” cocktails. 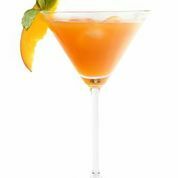 Top with Prosecco and serve in a chilled champagne glass. Put all ingredients into a cocktail shaker with ice, fine strain into a cocktail glass. SLOE BLOOM is a limited edition and exclusively available from Harvey Nichols’ stores and online. Just like puppies and kittens, Cocktails are not just for Christmas. Cheers! 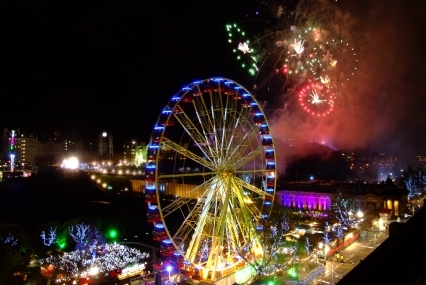 Celebrate New Year in Scotland’s Capital, the Home of Hogmanay for 21 years. Edinburgh’s Winter Festival over Christmas and New Year 2013 has been a fantastic success with a bigger and brighter feast of entertainment, a Carnival atmosphere, Funfair fun and Fireworks for all ages. 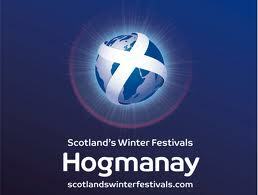 Scotland’s capital city is without doubt the ‘Home of Hogmanay’. 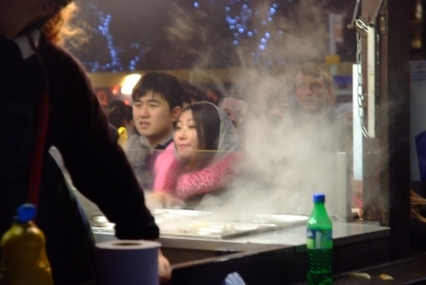 Throughout December, city visitors and local residents have flocked to Princes Street Gardens to enjoy a sky high ride on the Ferris Wheel, a whirl around the ice-rink and browse the European Christmas market. Over at St. Andrew’s Square, there were screams of delight from those brave enough to go on the Star Flyer; a circus cabaret at the Spiegeltent theatre, kids’ carousel rides, then warm up with a hot whisky toddy at the Chalet bar. First launched in 1993, Edinburgh’s Hogmanay is a three day Festival starting on 30th December with the ever popular Torchlight procession led by Viking Warriors, from George IV Bridge to Calton Hill. The finale was a dramatic Son et Lumiere fireworks and longship-burning spectacle. On the evening of 31st December, my partner Ken and I were among 75,000 international revellers gathering in the city centre to celebrate New Year at Edinburgh’s Hogmanay Street Party. The weather was perfect, mild, dry with a clear sky to see the dark silhouette of the Castle up on the rock. This is a major global event, welcoming visitors from over sixty countries including Australia, Brazil, Germany, Hungary, Italy, Japan, Korea, Malta, New Zealand, Portugal, Sweden, Turkey and USA. We weaved our way through the happy crowds of friends singing and laughing, many wearing crazy costumes – three men dressed as large yellow bananas! – and others in novelty hats, kilts and even formal tuxedos with black ties. The Street Party began with a burst of Fireworks from Calton Hill at 20:14 (8.14pm), followed by countdown fireworks at 9.00pm, 10.00pm and 11.00pm from the Castle Rock. Music performances took place all evening on various stages from Waverley Bridge to Frederick Street, featuring such bands as King Creosote, Django Django and the Rezillos. At the top of the Mound, the Rewinder DJs played the best dance tunes while those with tickets to the Keilidh joined in a truly Scottish party for traditional Highland reels and country dancing. The Concert in the Gardens, headlined by Pet Shops Boys with special guests, The 1975 and Nina Nesbitt, (live music from 8.30pm – 1am) was a sell out gig. The minutes ticked by very quickly amidst the festive mood and soon time for what we had all been anticipating, the magnificent Fireworks at midnight: a sparkling display of 16,000 shooting rockets and golden flashes from Edinburgh Castle lit up the night sky. 2014 had begun with a cracking, colourful bang. And the Hogmanay Festival continues next day on 1st January with more entertainment, Art Galleries, Films and outdoor activities on offer. The Loony Dook, 1st January. Start the New Year perhaps with a refreshing, chilly dip in the Firth of Forth – the Loony Dook – beside the Forth Bridge!. New in this year’s Festival was Scot:Lands, an imaginatively-curated programme of regional arts, culture, music and drama from around Scotland – families with children welcome and especially ideal for all the international visitors. And it was all completely free. At the National Musuem of Scotland, participants were given postcards and a map to set off on a walk around the Old Town to churches, galleries and theatre venues for a magical range of performances all afternoon. 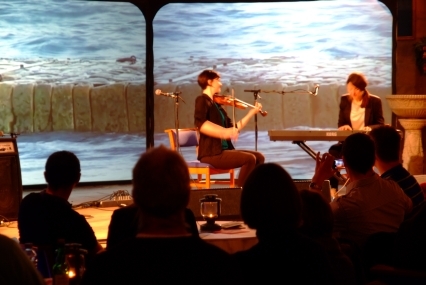 First to Greyfriars Kirk to hear Jenna and Bethany Reid from Shetland playing keyboards and fiddle, then on to Assembly CheckPoint for Highland Storytelling and Songs, with charming hospitality – local beer, cheese and oatcakes – from Ullapool. Our journey continued to the Hub to see the multi-media play, “Whatever gets you through the Night” by Cora Bissett and friends. The audience sat on rugs on the floor watching the romantic, enchanting story unfold through drama, mime, music, dance and film. As darkness fell around 4pm, we reached Old St. Paul’s Church to join a queue of like-minded Scot:Lands enthusiasts – many faces we had seen in each venue. We waited and chatted and shared our mutual, cultural experience from place to place and nobody minded the slight drizzle of rain. Soon we made our way upstairs into the ancient Church – dark shadows, candlelit. 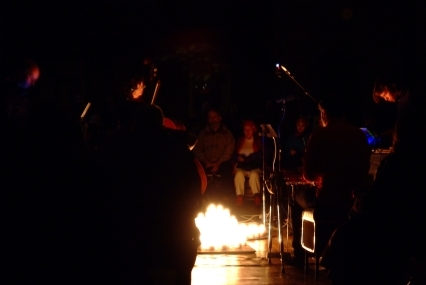 In the centre, the art collective FOUND, a unique band of eclectic instruments performed melodic, electronic, funky, jazzy music and choral songs. This dreamlike concert in the incense-scented chapel was the perfect, calm and quietly spiritual start to the New Year. 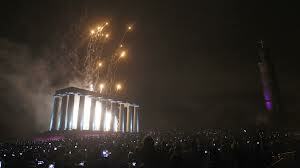 2014 is Scotland’s Big Year – Commonwealth Games, Homecoming, Ryder Cup, Arts Festivals and a lot more besides! 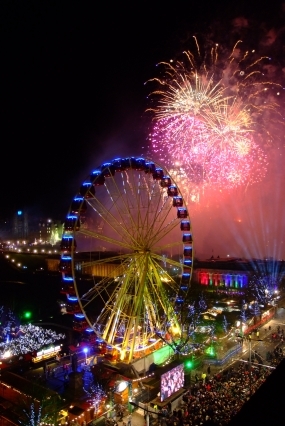 Edinburgh’s New Year Festival is one of her 1,000 breathtaking places to see. If you haven’t experienced Edinburgh’s famous Hogmanay Party, add it to your own travel Bucket List now!